At Enrique Tomás we have been dedicated to Jamón for more than thirty years and the maxim that we have followed during all this time is one: a customer is not the one who buys, but the one who returns to our stores to buy again. 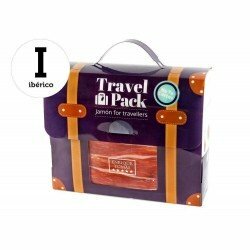 As we want you to come back, we offer you a Paleta Ibérica de Cebo ( Iberian Ham shoulder) of the best quality, cured during the right time, 18 months. The Paleta ibérico de cebo comes from the front legs of the Iberian pig, a breed of pig native to our peninsula that is only located in the interior areas of the country and in some parts of Portugal. The Paleta Ibérica de Cebo is obtained from the pigs fed with natural feed, cereals and grass on farms with the best conditions to guarantee you a unique product and grant the pigs with the highest quality of life, because at Enrique Tomás we know that their happiness affects the quality of their meat and that is why we take care of them from the very moment of gestation. This is the only way to make sure that the flavor of your ham shoulders is the best and, so that you can enjoy it without problems, we offer you whole, boneless or sliced ham shoulders (paletas). There's no excuse anymore! The Iberian pigs have an advantage over other animals, they are the only ones on the planet capable of infiltrating fat into the muscle, which results in these small white veins inside each slice that give it this marbling effect. Once the pigs have reached 150 kilograms of weight, the curing process begins. In the elaboration of the Iberico de cebo ham shoulder, the expert’s work is very important in order to obtain such a delicious final result. The quality of the Paleta will be determined by climatic conditions and by a dry curing process of 18 months, which is the only way to achieve such a characteristic taste. The meat of this type of Paleta is appetizing, juicy and full of nuances and its flavor is perfect for the finest palates that enjoy every nuance. The taste of the Paleta is more intense than that of Jamón and from the first bite you will notice all its nuances in the mouth. In addition, at Enrique Tomás we offer you Paleta Ibérica de Cebo from all areas of Spain and in all formats. Enjoy this delicacy!